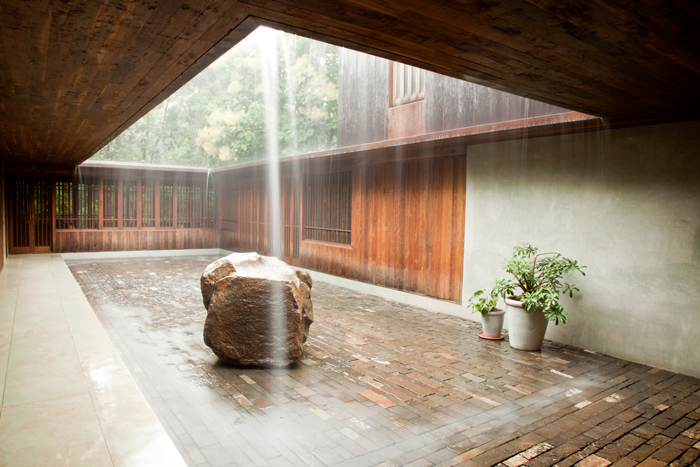 Studio Mumbai is unlike any other modern architecture practice. The studio works collaboratively with local artisans, craftspeople and draftsmen to design and build projects through an explorative creative process. This includes large scale mock-ups, models big–and–small, material studies, sketches and drawings. 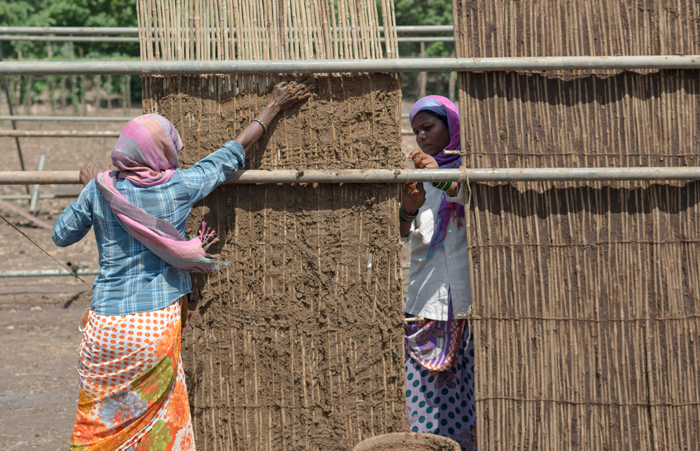 The studio’s projects are developed with care and consideration of place and practise while drawing from traditional skills, local building techniques and materials, and the ingenuity that arises from limited resources. 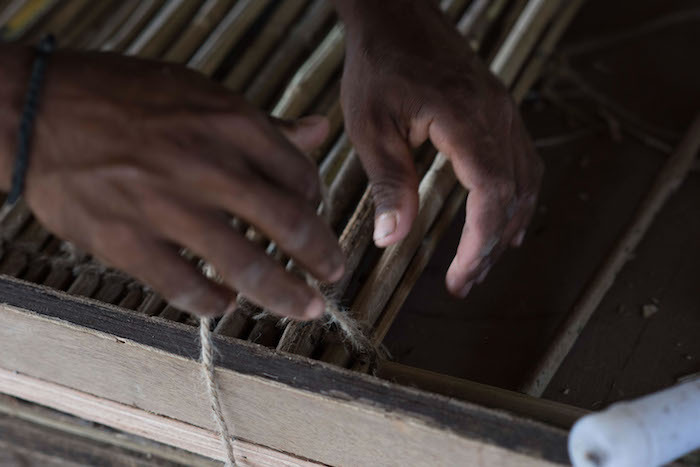 The studio’s expression in built form—and Bijoy Jain’s practice—is deeply informed by the concept of ‘lore’, defined as “a body of traditional knowledge passed on by word of mouth”. 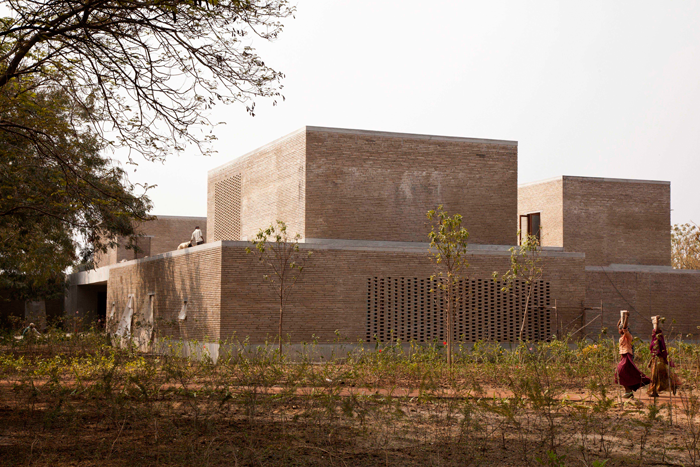 Studio Mumbai creates architecture that ‘contains the life of its environment’ and this concept is expressed in commended projects including Copper House II, Palmyra House, Ahmedabad House and Saat Rasta, as well as future projects including Onomichi Community Center in Japan. 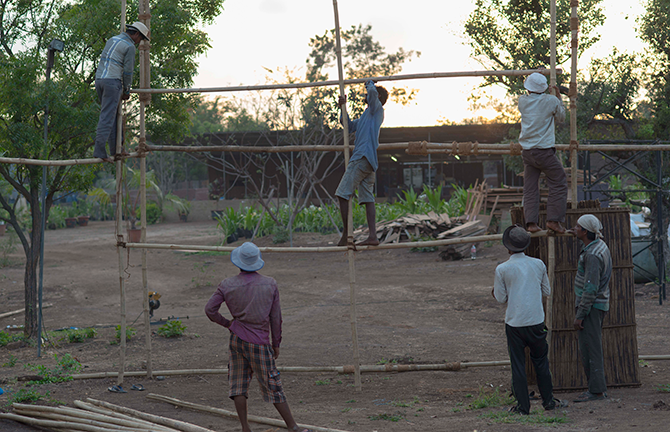 The studio’s philosophy of local collaboration and sensitivity to the local context is manifest in its stunning headquarters in Alibag (south–west of Mumbai) and is similarly but uniquely expressed in MPavilion 2016. Studio Mumbai’s distinct creative process and ethos from conception to built form has received wide-reaching admiration. The studio presented at the XII Venice Biennale and the Victoria and Albert Museum in London. It has received awards including the Global Award in Sustainable Architecture 2009; Finland’s Spirit of Nature Wood Architecture Award 2012; the BSI Swiss Architecture Award 2012; and the Grande Medaille d’Or 2014 from the Academie D’Architecture in Paris. 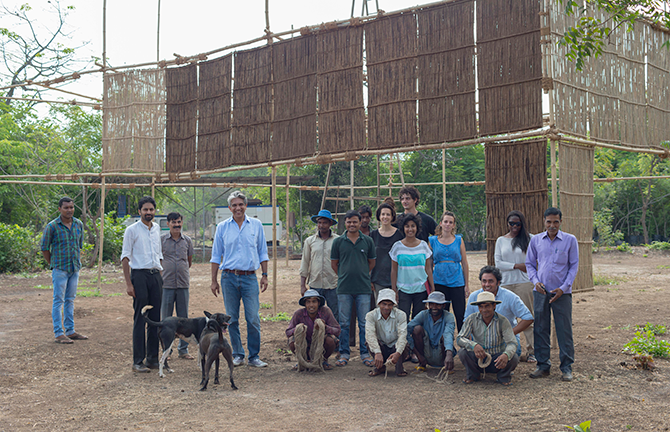 Bijoy Jain has taught in Copenhagen, at the Yale School of Architecture and the Mendrisio Academy of Architecture. 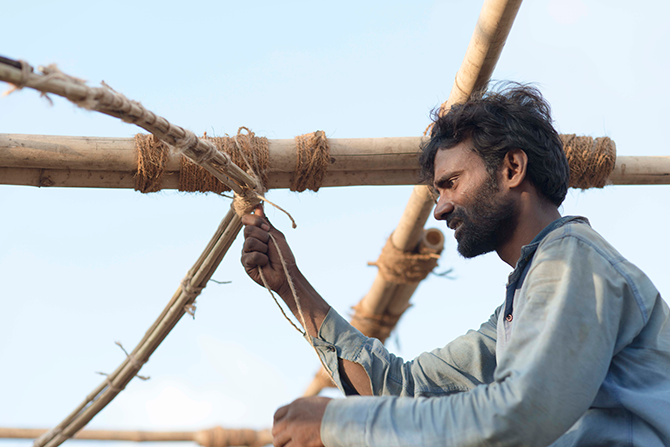 In 2016 MPavilion welcomes Studio Mumbai’s Bijoy Jain as its architect. The space between the eye and the base of the bill of a bird or between the eye and nostril of a snake. Instinctive response to any condition is honest and devoid of any burden of culture. Such intuition is immediate in time and space. This detachment allows awareness and freedom. Our pursuit is to postulate an environment that is elemental and sensorial, a field of varying conditions curated from our observations of everyday life. These conditions are formed to instigate or negotiate inside and outside. The works independently and collectively evoke indeterminate experiences. The idea is not to guide observers but to allow discoveries through visual layers. 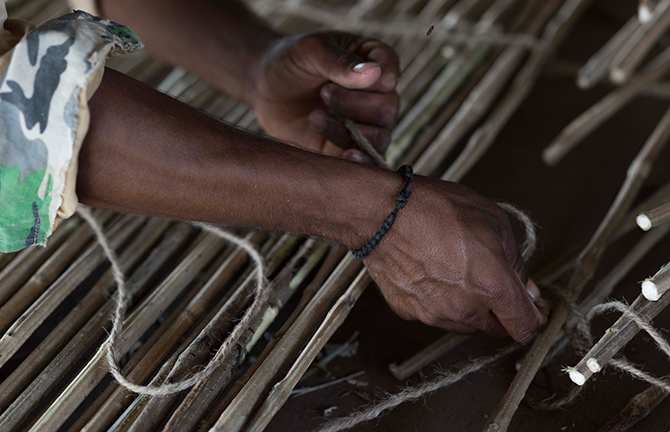 The act of making is embodied, both viscerally and physically, in the works. We hope this then emanates through the experience of these objects. The embedded energy of these objects has a potential to resonate with that of their observers. The works remain neutral and become containers of embodied energy – of thinking, making and seeing. All of these conditions defy their actual purpose and presence. They exceed their everyday existence and are neither contained nor in-finite in their presence or absence. we do then is with awareness and intent however temporary or short-lived. We live in overlays of varied landscapes – natural and cultural. Our notion of the world is formed through continual engagements with these landscapes. We would like to constantly traverse these landscapes physically and metaphorically to continually expand our world. Through our continued research and documentation of these landscapes, we have discovered many phenomena which are discreetly present but non-extant in the collective consciousness. We are curious to test how this tacit knowledge can be transferred. Main image by Rory Gardner.